A lot of tasks in Photoshop can be quite time consuming and repetitive. Such activities are prime candidates for automation using Photoshop Actions. To provide you with a real life example, a friend of mine likes to prepare his image for Flickr with a nice white border. By recording the steps to add the border using Photoshop Actions, the Actions can be replayed against any image. You can read more about this in the tutorial Preparing an Image for Flickr. In a moment we will look at how to record a Photoshop action, but first it’s important we look at how actions are organised. If we don’t get this organisation set up it will become increasingly difficult to find and use the actions in the future. We manage and organise our Photoshop Actions using the Actions Window. You can see an example of this below. If you can’t see your actions window it’s probably not open. You can open it by selecting “Window | Actions” in the Photoshop Menu. You can also use the keyboard shortcut which is “Alt + F9” (Alt is the Option key on the Mac). When it comes to organising your actions the first rule is to give the action a meaningful name so that you understand what it's doing when you see it at a later date. You can also rename existing Photoshop Actions to give them a more descriptive name by double clicking on them in the Actions window. The second guideline to follow is that you can place groups of related actions under an Action Set. The Action Set should also have a descriptive name that categorises all the actions it contains. Once you have a number of Action Sets created you are able to drag and drop Actions between these. Follow these simple rules and you will find using Actions becomes more productive. Having organised our Actions window let’s look at how to record a new action. The concept behind actions is that you will work on an image and record all the changes you make to the image. Once complete you will be able to replay the action against another image to make the same adjustments to that image. Every time you want to repeat making the same adjustments to an image you will open the image and simply replay the action. Open an image in Photoshop. This will be the image you work on when recording the action. 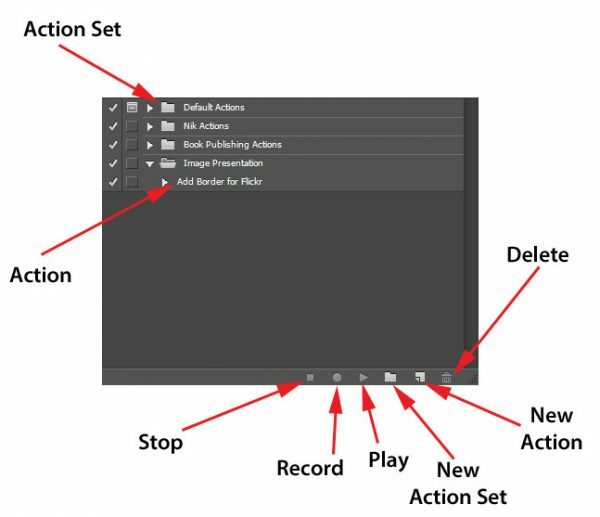 In the Actions window select the “Begin Recording” button. From this point forward all your key strokes will be recorded into the action. Take your time and think about each change you want to make. There is no rush as the action does not record time delays. An alternative to clicking the “Begin Recording” button is to select the “Create New Action” button. This causes a dialog box to be displayed where you can enter the name of the action. Make your changes to the image. Each change you apply will be recorded so that it is played back when you use the action. When you have finished your edits click the “Stop” button in the Actions Window. This causes the action to stop recording. It is then ready for replay. 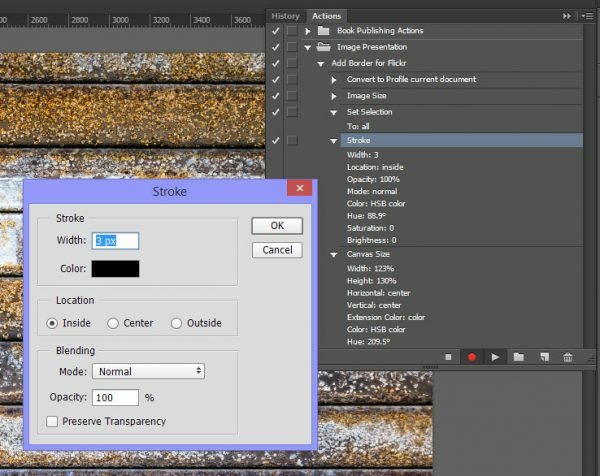 Open the image you want to work on using the action in Photoshop. Open the Actions Window if this is not already visible. Find the action you want to use in the Actions Window. Click on the action to select it. Click the “Play” button to replay the action. Once the action completes the image is ready. There is an alternative to the above process using a shortcut key as described below. When using the “Create new action” dialog you can set another useful feature which is to assign a Key to the action. The key then acts as a shortcut for when you want to play the action back. Rather than selecting the action in the Actions window and clicking on the “Play” button, you would just press the assigned key. In the Actions window you can expand an existing action and select individual steps. It’s then possible to delete any of these steps if you find you have added a step in error. You can also change the order of execution by dragging the step to another location in the action. If you find you have all the editing steps recorded but you want to make a change to a particular step you can edit the step by double clicking it and entering the new settings. You can see an example of this below. Once you have an action recorded you are able to play it back automatically against a group of images in a folder. Using Photoshop Actions to help process your photos can be a significant time saver. Watch out for tasks that you find yourself repeating regularly in Photoshop. These are prime candidates to be automated.